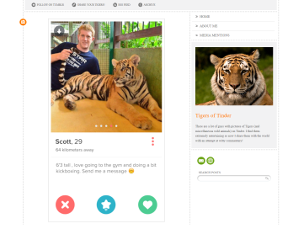 The guys-posing-with-tigers-on-Tinder trope isn't just a played out profile pic, it's a global phenomenon that’s inspired Tumblr, blogs, think pieces, and a scolding letter from PETA. It may now be coming to an end. To honor International Tiger Day on July 29, Tinder announced it’s taking a stand against photos taken with tigers and other wild animals. Tigers and other wild animals used in tourist attractions are frequently exposed to extreme stress and physical abuse. They are often removed from their mothers at excessively young ages, sometimes within hours or days of birth so they can “get used to” behind handled by people. Trainers then their “break their spirits” by beating them into submission so they’ll perform on cue. Once they become larger and more dangerous, the animals are typically locked in warehouses where they’re neglected, or heavily sedated so they don’t pose a threat to snap-happy visitors. It doesn’t always end well. And because the window of profitability is so short, breeders constantly churn out babies so that they always have an “inventory” of cubs available. We can all agree: animal cruelty is a poor way to impress a potential match. Users are encouraged to tag any friends with tiger photos and join the conversation on social media with the hashtag #NoTigerSelfies.